Tinker 9th Century Viking Swords for sale are 37 3/8th inches in all and weigh 2 ¾ pounds. These cutting swords are designed by Michael Tinker Pearce and inspired by real 9th Century Viking Swords. They feature a functional 30 7/8th inch sharpened 5160 carbon steel blade. 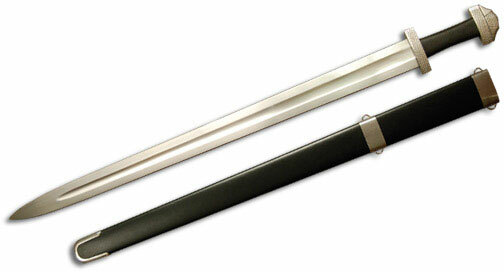 The 6 ½ inch wooden handle and the wooden scabbard is covered in real leather. They are peened at the pommel. The point of balance is 4 ¾ inches and the point of harmonics is 20 ¼ inches. The guard width is 2 3/16th inches and the tip width is 1 ½ inch. Buy these 9th Century Viking Swords for $259.99.